Luminaria 2017 on Pablo Court in Old Ponte Vedra Beach. Photo courtesy of Kathy Rhodes. The Northeast Florida Luminaria event, held Sunday, December 17, was a success. Sponsored by Berkshire Hathaway, with all proceeds going to local charities, it was an opportunity for neighbors from Riverside to Ponte Vedra Beach to Atlantic Beach to get together and add a little holiday spirit. Given that it was the first year, not every home knew about it, or got it, but my expectation is that it’ll be a big hit next year if the tradition carries. Luminaries are white paper bags with votive candles in them. BHHS sold them in batches of 5, 10 and up. Pablo Court (cough, my neighbors) in Old Ponte Vedra Beach particularly shined, as all the neighbors got together to decorate the cul de sac. North San Juan also really pretty. Our family was so inspired, we drove down to the infamous house in Atlantic Beach that offers a Christmas light extravaganza. Seriously, if you’ve never taken the drive down to see this house, it’s worth it. This gentleman puts up over 60,000 lights and times their blinking to music. It is over the top and amazing. Last night we had the pleasure of meeting him, as he walked around handing out treats. Here is a link to his website with directions. The house is at 402 Snapping Turtle Court East in Oceanwalk. 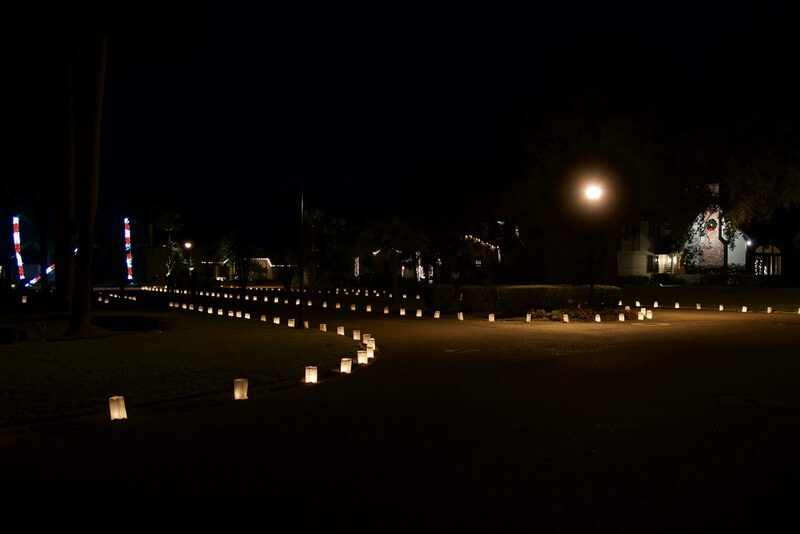 Our drive down showed luminaries lining the streets from Ponte Vedra through Jacksonville Beach, Neptune and all the way down Seminole in Atlantic Beach. Fun event. Thanks BHHS.